I just finished my second quilt for the Quilts of Valor foundation. 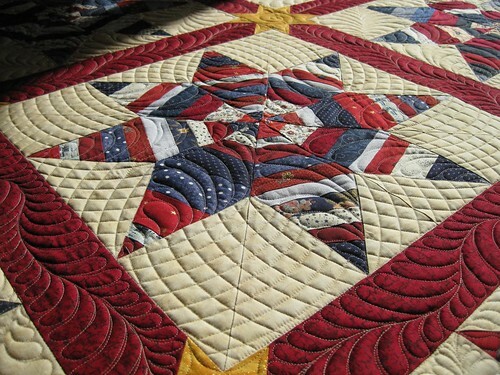 The mission of the QOV Foundation is to cover ALL those service- members and veterans touched by war with Wartime Quilts called Quilts of Valor (QOVs). 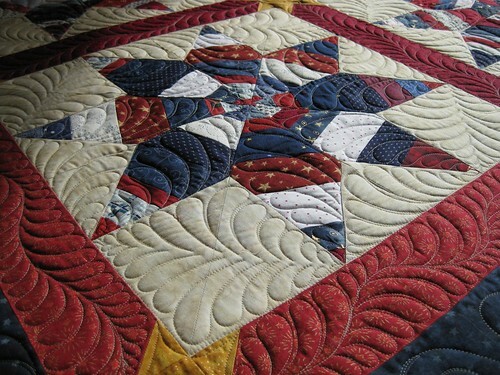 I started the quilt in a workshop with a well known quilt artist, teacher and author, Gwen Marston in May 2008. She taught the class to use “string” quilting where narrow strips of fabric are sewn together to create “new” fabric. I worked with red, white and blue strips. When I sewed enough together, I used a diamond shaped plastic template to cut out eight points for each star. I made nine of these eight pointed stars, smaller gold stars for the corner stones and an additional striped border. Only this year, 2011, was I inspired by the QOV work to complete the machine quilting and get the quilt ready to send to a recipient. I hope he or she it enjoys it. 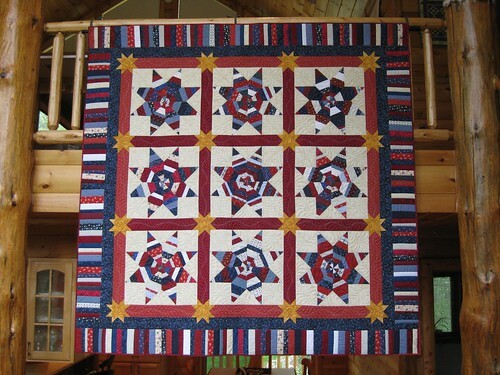 This entry was posted in Quilting, Quilts of Valor. Bookmark the permalink. GORGEOUS ! ! ! ! 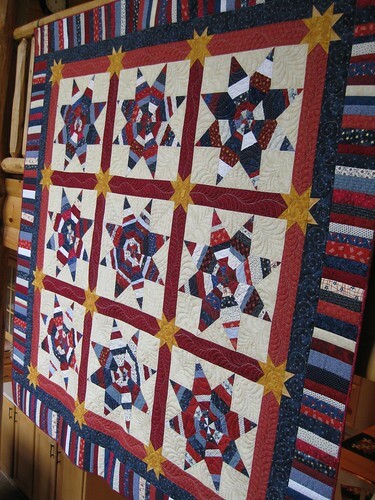 What a gorgeous quilt……its really eye catching. My son was the recipient of your quilt and brought it with him when he came to see me today. This is a piece of art and will be an heirloom. 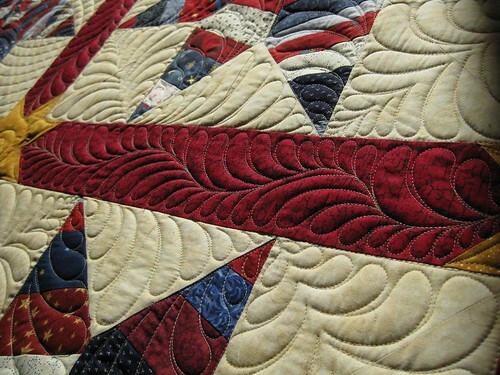 I have never seen such amazing quilting and we are all so appreciative of the time spent in creating this masterpiece. It is a wonderful thing you all are doing for our service members. 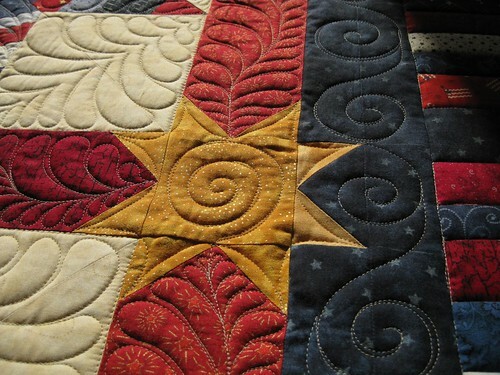 Learning to quilt is on my “bucket list” and this will very likely be my inspiration to do so. Thank you so much for giving of yourself to thank our service members. I have been wanting to make a VOQ and have fabrics to do so. I will make that my New Year’s resolution to get one done in 2012. I have thoroughly enjoyed your (is it a blog? website? – I’m not that computer literate) and found the ‘Follow’ page. Thanks so much for sharing and inspiring.